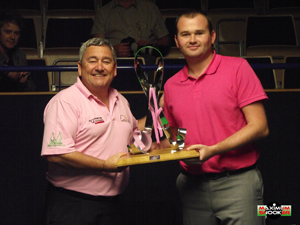 Last weekend Walsall professional Mark Joyce became the second winner of the Pink Ribbon tournament down in Gloucester and defeating the likes of John Higgins, Stephen Maguire and Michael Holt along the way, he sure had to do it the hard way! PSB: Hi Mark, first of all congratulations on your victory at the Pink Ribbon last week, looking at the list of players you had to beat you certainly deserved it! PSB: How did it go because I didn’t see that one actually…? MJ: Yeah I went 3-1 down, I missed a couple of blacks off the spot, one was cueing off the cushion which is the only really bad thing that has come out of the accident that I had (more on that later), because I am still struggling to cue from off the cushion, my hand sort of shakes a little bit. I can’t stop it when I’m cueing off the cushion and putting pressure on it so that is something I am trying to work on in practice. So I missed a black off the spot from the cushion and he had a one-visit break, then I missed another and he did the same again so I was 3-1 down when really I should have been two each at worst, maybe 3-1 up. After that I came back and I didn’t really give him a chance to be fair. I played really solid so that turned out to be my hardest match on paper in terms of the scoreline and going to a decider. I managed to get through that one and then it couldn’t have worked out much harder really. I had Stephen Maguire first up on the Sunday, played pretty solid against him, he missed a couple but still I played quite solid. MJ: Yeah I finished dead straight on the blue, I could have dropped that in which would have put me 50-odd up with 67 on but I knew that I would not finish on a red. I thought that I was not going to play negative and just drop the blue in so I played the pink, screwing across one cushion to land behind a red which was tight on the top rail but I just cued the shot badly, snatched at it a little bit as it was sort of match-ball. You give John half a sniff and he ended up taking control of the frame and making a good clearance to nick it on the black. Then all of a sudden it’s 3-2 and you are thinking ‘oh you know’ but to be fair I’ve held myself together in the last frame, made a solid 40-odd, played some good safety and managed to get over the line 4-2. MJ: After beating Maguire and Higgins, I’m not going to say that the hard work was done but I sort of thought that the tournament was there for the taking to be honest. I was probably the highest-ranked player of the four semi-finalists so I fancied the job and having beaten those kind of players didn’t then want to lose in the semi-finals. Obviously Michael White is a very good up and coming player but like you have just said, the key frame was probably the third as after the first he had a 50 and an 80 in the second, before making 40-odd off my break-off to look like moving ahead. After that however I have managed to make a good clearance of about 80-odd, 90-odd to nick it to go 2-1 up. Then after that, well you watched the last couple of frames, I just played solid really, no fireworks, I just played good safety and took my chances. The pressure was on him so I let him try to force the issue and for me to punish the mistakes. MJ: Yeah he should have had first chance really, he missed a blue early on and I made a break from it, 80-odd I think it was and that settled me down. All weekend there were no fireworks in the scoring department but I was really happy with my safety play – that was one area I was really quite pleased with. I didn’t give many free chances away which at the top level you can’t afford to do. I scored solidly when I got in and did not miss a lot, but against Higgins for example, knowing what a good tactical player he was, I felt like I competed in the safety department which is what you have got to do. PSB: Yeah absolutely. 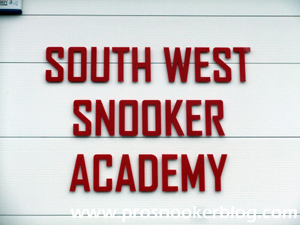 Last point on the Pink Ribbon, obviously it’s not the first time that you have been down to the South West Snooker Academy, what do you make of the place? MJ: You can’t fault it can you? PSB: No not at all! 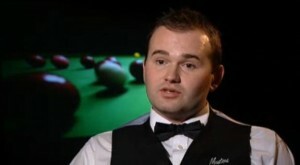 MJ: Nobody has a bad word to say about it really, it’s a purpose built snooker facility, it’s just great. It was the first time I had played in the arena in the final and it’s just beautiful, hopefully we will have more and more qualifiers down there in the future. PSB: Yeah, I heard for the UK’s they are going to put partitions up, what do you make of that, think it’s needed? MJ: Sometimes if it is open plan your eyes do wander, but again that’s just discipline isn’t it? You have just got to take what conditions are put in front of you, take for example the German Masters which was open plan. Perhaps that is just the way that the game is going. It’s probably why Mark Williams has done so well, he can just adapt to any format, whether it’s cubicles or open plan, he just gets on with it and that’s the attitude you have got to have really. PSB: And also they are changing the format for the UK’s this season, making the qualifiers best of 11. MJ: I mean when you look at it last year every match that I won on my way to the quarter-finals I got to six first and the match I lost I didn’t get to six first so if it had been a best of 11 last year I would have still got to the quarter-finals so it wouldn’t have affected me. But it is a bit of a blow because I would prefer to play over 17 frames but we have just got to get on with it. PSB: I guess they are trying to save days on the calendar as well, obviously now with it being a four day event now it is like ordinary qualifiers so to speak. MJ: Yeah it is yeah, I mean I am surprised they have kept it at 11 for the venue as well. PSB: Have they done that? MJ: Yeah that is up to the quarter-finals I think. PSB: I hadn’t heard that, that will annoy a few people! 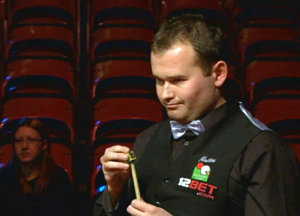 MJ: Yeah, I think the longer frames…it’s proper snooker isn’t it? There are more ups and downs in a longer match. PSB: You get a story don’t you? PSB: Would you like to see more events staged at the Academy down here? 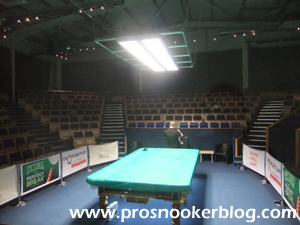 MJ: Hopefully they will get more qualifiers over in Gloucester because with the set-up there you can catch two or three tables at once if you sit at the right angle can’t you? It’s good for the players as well, although there weren’t that many people watching on Sunday, it was still nice to play in front of a crowd. The size of the arena made it look like there was nobody in to be honest but there were still 40 or 50 people there watching and as a player it gives you a bit more of a buzz knowing there are people watching, nobody likes to be stuck in the cubicle. Look at me talking, if you think of somebody like Hendry or some of the other people who have played in front of millions of people all over the world and all of a sudden they are stuck in a cubicle, nobody wants to do that but again you have just got to get on with it with so many points available. A lot of players last year made the mistake of underestimating the PTCs and some have suffered ranking-wise so I think this year some of the players will take the PTCs a hell of a lot more seriously. 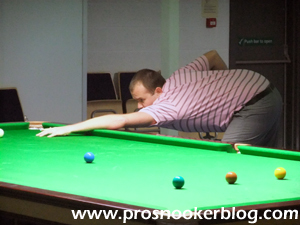 PSB: Looking back at last season, as referred to previously obviously the highlight came at the UK Championship where you won four matches to qualify. As it turned out, falling out of the top 64 sort of helped you in a way! MJ: Yeah, I mean I was gutted when the rankings were revised and I fell out of the top 64 for the first time for a couple of seasons but as it turned out it worked out to my advantage. I managed to get that first match to give me a little bit of match practice and confidence and just went on from there really. MJ: Yeah I’ve had three tough matches, I was 5-1 up on Jak, missed a silly pink on 50 for 6-1 and he’s made a good clearance, then you know what’s coming as he made it 5-3 and I felt like I had lost that session. After that it had given him a bit of hope and he had come back and played well really, just a bit of experience got me over the line. Then the Alfie match was probably the highest quality of all of them including Telford. We were both in the Travelodge afterwards having a beer and Alfie said that he couldn’t have played much better than that or be unhappy with the way he had played, think he made eight or nine breaks over 50 and lost 9-7 so the standard of snooker in that match was unbelievable. Then the next match I played was Marcus Campbell and was 5-3 up before going 8-5 down having just not really turned up for the second session. After that I don’t know what happened, I had a little chat with Barry and I remember him saying to up the tempo a little bit, that I looked a bit lethargic around the table so just to walk around the table a little quicker. So I played really well, making three 50+ breaks to go eight each before the decider which was a little bit more negative, a safety battle with neither of us wanting to take that big shot on. In the end it ended up lasting about an hour but luckily I managed to knock in brown, blue and pink to nick it. It was a late, late night and I was on first thing again the next day to play Steve Davis but after the get out of jail card the night before I was determined I was going to qualify for Telford, especially with it being a home event only 20 minutes up the road from me. PSB: Did it affect you having a late night like that as well as an early start? Did it take you a while to get going or were you still pumped up for it? MJ: Yeah I think I was, mentally really you have just got to get on with it, it’s not ideal but I knew that would be the case beforehand and there was no time to think about it too much. I just had an early night, tried to get some sleep and to be fair I was playing Davis too who is one of the legends of the game so if you can’t get up for that then there’s no point playing really! MJ: Yeah he would have been in the top 32, I think I am right in saying that my win put him out of that so I played really well against Steve. He can still compete in the safety department but he just didn’t score that day and missed a few silly balls and that ended up being my most comfortable match in the end. PSB: So how did you feel going into your match with Ali in Telford? MJ: I was just determined to enjoy it, I think at the time Jimmy and Hendry were playing and I guessed they would be on one of the TV tables and then the other match was between us and Mark Williams I think who was playing at the same time. I was thinking to myself whether I wanted it to be on telly. It’s one of those, do you want to go on the telly where Ali would probably be more of a favourite because of his greater experience or do you want to play on one of the back tables which would probably suit me having played four matches there before? In the end it was the TV table and I was delighted to get a win on the telly really. Twice before I had played on the telly was against Ronnie and Higgins and it is hard enough playing in front of the cameras the first couple of times but against players of the calibre of those two makes it even harder. PSB: You started well I seem to recall, you made a century first frame I think? MJ: I had 97 yeah which obviously settled me down straight away. The thing was Ali wasn’t playing at 100% for whatever reason but I just felt comfortable, match-sharp, a bit like the Pink Ribbon. I felt comfortable around the balls, at ease with my game and just determined to enjoy it and that was the attitude really, just to try and enjoy myself. The pressure wasn’t off as I still wanted to win but I had already won four matches and got a few ranking points so I just wanted to go there and do myself justice, show people how I could play. Obviously in the cubicles you are just a name, nobody sees you play so it was good to just go out there and produce. MJ: Yeah Judd! That was another cracking game, I played very well to go 5-2 up, not missed a ball really first session and then a big frame was the last one before the mid-session interval. There he managed to fluke an outrageous snooker to leave me tight behind the green with the reds everywhere and it was hit and hope and I’ve stuck him up. He’s then made 70 to go 5-3 so it was just a big frame, the difference between 6-2 and 5-3 is massive so I knew I was still in for a tough match. 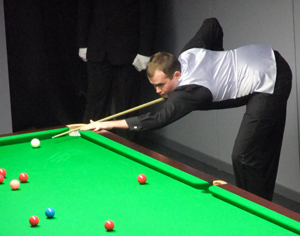 Everyone expected Judd as favourite to come back at me which he did, I think it came back to 5-5, then 6-6 at the interval and I was quite happy with that as I was under it a bit for the first four frames of the evening session. Had I lost the first four to trail 7-5 I would have been gutted but at 6-6 I was ok and got it in my head that it was a best of five. The next frame I made 50, Judd has cleared up with an 80 to go 7-6 and then I don’t know what happened, something kicked in and I’ve gone up another three gears, had 90 and 70 to go 8-7 and then played a decent last frame. I was really happy with how I responded from going 7-6 down to be honest. MJ: Yeah I’ve played Judd since he was 10, I’ve played him that many times now and watched him grow up really. I’ve beat him the last three times I’ve played him but the one thing Judd has is that he is so attacking, nothing is safe and players struggle to really settle against him. That said I have played him so many times and watched him grow up so it doesn’t really faze me anymore because I know exactly what to expect from him. PSB: Yeah I guess some of the players at the Crucible who haven’t played him so much might not have known what to expect? MJ: Yeah some may have heard about him but when he does it against you they find it hard to settle, he does play a unique style of snooker, very aggressive, very attacking and the last couple of months it has come off for him. Over a season I’m not convinced that style of play can carry him through tournament after tournament. I think Shaun Murphy found that out when he won the World Championship in 2005. He was going for everything and those couple of weeks at the Crucible everything went into the back of the pocket but he then struggled to win another tournament and had to bring a safety game into it. Whether or not Judd will change his game I don’t know. At the minute the balls are going for him so I don’t expect him to change anytime soon! PSB: Yeah and that was a strange one wasn’t it, particularly the first session! MJ: At the time I was delighted to get out of the first session at 4-4 but on reflection now I should probably have been 6-2 up. I didn’t have much run of the ball at all during the first four frames, first frame I’ve potted a green and knocked a red in which cost me the frame and then in the next I’ve had a great clearance to the black which has then gone around the middle pocket and come back so I was unlucky to be 4-0 down. I was delighted with the way I responded though. You know it was a big game on the BBC and I wasn’t going to chuck the towel in and I’ve managed to come out and play three good frames. The last one was a little scrappy and I was probably fortunate to nick that one but from 4-0 to 4-3 I’ve played quite well, had a hundred, 90 and 50 something and nicked the last on the pink to go 4-4. To be honest I fancied the job on the night-time but the big frame was the 11th where I’ve gone 50 odd up but then Williams pulled out two shots that probably only he could have pulled out. First he dropped a red in down the rail before on the next shot potting a pink into the middle from the rail and making 70 from it when 50 behind. That frame was a big body blow to me, a massive turning point. Had I gone 6-5 I had him under it a bit, he was struggling out there. As it was I didn’t really compete in the next frame, it was like a blur and I was suddenly 7-5 down at the interval and I probably should have been level at least. Then again I’ve brushed myself down, come back out and made a 143 which is nice, obviously the highest break of the tournament which was quite pleasing, to get the high break at the UK which is a good achievement. PSB: And a bit more prize money as well! MJ: That’s it yeah, just before Christmas which was handy. But yeah 7-6, whether you have won a frame on the black or made a 143 it’s only frame at the end of the day and I was just trying to hang in there really but I could just never get back on level terms. 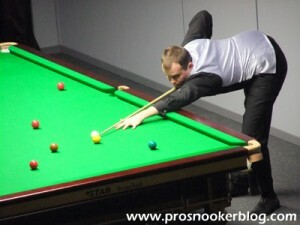 Every time I got close to him he played a really good frame. He played a good frame to go 8-6 and then I’ve gone 8-7 and I thought if I could just win this one to force a decider it would be the toss of the coin but unfortunately when he needed to produce a good frame he did and I didn’t really get a look-in to be fair in the last frame. PSB: How frustrating was that not to be able to build upon your run at the UK’s having just made such a big impact on the game? MJ: Yeah I’ve gone up from 60 to 47 after the UK Championship and obviously got no points to defend from a couple of years ago so at that point I think I was up to about 39, 40 with points dropping off. All of a sudden I saw three more tournaments as well as the World Championship and was confident of being able to push on for the top 32. Then however the accident has happened and I’ve done well to even turn up to be fair for the last three tournaments. 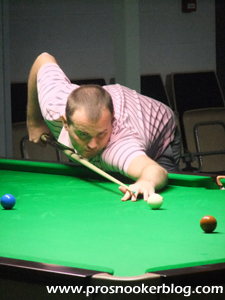 Had there been any tournaments in January then I certainly would not have been able to play them so I was a little lucky that there were no more tournaments before the Welsh qualifiers in February. For that event however I think I had one day’s practice before so everything just came a little bit too soon for me. I got myself playing before the World Championship but I was nowhere near sharp enough to compete at that level. PSB: I caught bits of that match against Liu Song but you couldn’t quite get into it could you? MJ: Yeah the start kinda stuffed me, all credit to Liu Song, the first couple of frames he didn’t miss a ball and then the third frame was key. I was on about 40-odd, played a thin safety, gone in-off and he has then knocked a long red in, got on the black, knocked a red off the side rail and gone on to clear up on the black for 3-0. What I was doing at the UK was coming back and responding to set-backs such as this because I was match sharp but here I was never quite sharp enough and could not fight back. The game was not there. Fair play to Liu though, he played well. PSB: So moving on to the new season, obviously you are playing well having won last week, how happy are you with your preparations ahead of the new season? MJ: Yeah I think I’m fresh, I’ve not really played a lot of snooker this year after what happened to my elbow which wrote off the end of last season so I’m coming into it raring to go this time. I had a week away on holiday, have come back and practised really hard since. Obviously I didn’t expect the result to come so quickly but I’m delighted with how I played last week and hopefully I can continue to improve at the first PTC. PSB: Between now and then do you have any particularly plans or is it a case of just practising and getting your head down? MJ: I have been practising for a bit with a lad over in Birmingham, Jordan Rimmer, he’s just won the Midland Amateur Championships, he’s only 16, is a decent player, got a lot of potential so I have been giving him a fair few games over the last few weeks. He has got a nice set-up at the club over where he plays. Otherwise I have got a few games lined up, have got the table-fitters coming Tuesday to put my new cloth on and my coach is coming down for a day on the Wednesday. Then I have got Nigel Bond coming down on Thursday. I probably practice more with Nigel than anybody as we room together when we go abroad and stuff so I am quite close with Nigel. PSB: Is that something that helps you a lot, match practice with professionals rather than practising on your own? MJ: Yeah I like to mix it up, you can get into a bit of a rut practising so what I like to do is to have a mixture between playing on my own, playing players who are amateurs where you get quite a bit of table time and I can work on my break-building and things like that and they can pick the balls out for me! Then I also like to arrange games with other professionals and test my game in that department. I think it’s good to mix it up and also so I am not stuck at the club every day. I like to travel out at least once a week because you can get too much in your comfort zone in your own club and used to the way your table plays. Sometimes it is good to travel a bit and struggle on somebody else’s table in comparison to how you would play on your table. MJ: Yeah I’ve not changed the cloth since last June. Normally I will get it changed at least twice a year but obviously with what happened I didn’t see the value of having a new cloth on for the end of the season because it just would not have been used. I needs changing desperately now though so I am having that changed on Tuesday for the first PTC. MJ: Yeah the target is to win a PTC. I think with what I did at the UK and now winning the Pink Ribbon, although obviously that wasn’t a ranking event and there were amateurs in it, it’s a bit like the PTC where you can come up against amateurs. If you look at the players I beat to win the Pink Ribbon that could potentially be your seven matches in a PTC so there is no reason why I can’t win a PTC. MJ: Yeah last year you had Marcus Campbell and Tom Ford which just shows the strength in depth and although I’m officially 42nd in the world in my own mind I do feel that I am a better player than that. I certainly feel that I am good enough to be in the top 32 so I have got to go out there and prove it, go out there and pot the balls. I would also like to qualify for more venues. I love being out there, playing on the telly, the buzz at Telford in the UK’s and that experience will stay with me so I want to have that experience more often. MJ: Yeah I have been a bit unlucky a few times in the past. This year speaks for itself but last time I won a couple of good matches and came up against Jamie Cope and I probably wasn’t quite mentally ready. Obviously it is a big match to get to the Crucible but in the last year I feel that I have come on a lot mentally. I didn’t turn up against Jamie that day but I feel more ready now to get to the venues and compete against the top players. PSB: Does that just come with experience? MJ: Yeah I think so, I think it’s just belief as well, that run at the UK’s gave me so much belief and although I was not able to build on that, I have had two or three months out to really think about things and now I don’t see why I should be frightened of anybody. 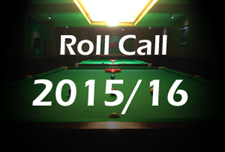 I can play, I can score, ok perhaps not as good as the best but I can play solid snooker. Hopefully I can continue to produce the kind of snooker I was playing at the weekend, try to improve on that and hopefully push on into the top 32 as soon as possible. PSB: For those who have not seen you so much, how would you describe your game? MJ: I think that during the last 12-18 months my game has come on a lot. I think you can point to the PTCs as during my first four seasons on the tour we had six to eight tournaments a year so in my career before last season I had probably played in about 24 tournaments. Last season however I probably played that many in just the one year so in terms of match-practice I think last season brought me on no end, particularly in the safety and tactical area. Also the run at the UK gave me the confidence to think I can compete and beat anybody really and that sort of came through at the Pink Ribbon where whoever I played, Maguire or Higgins, I fancied beating them. MJ: Yeah I have shown glimpses, I had a good week there, lost to Judd Trump in the final though my season tailed off from there really. It’s very difficult though when you lose your match and you have to wait 6-8 weeks until the next one. Now though I’ve had the Pink Ribbon last Sunday, I’ve got the PTC next week and then Australia the week afterwards so you haven’t got time to think about it too much which is great. PSB: On the subject of the increased amount of events on the tour at present, how do you think that will help the younger players on tour in particular? MJ: I think that it takes a little bit of pressure off them, in a couple of ways. Obviously you have got a lot more tournaments, which is good and the rankings have been changed so you can move during the season, but also after the PTCs have finished around December-time, eight players are guaranteed their places aren’t they? 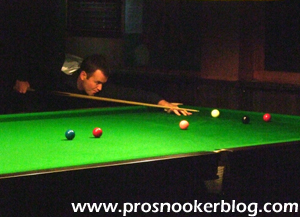 Like Jack Lisowski, he’s safe by that time, he can relax a little bit and then he has qualified for a couple of venues. PSB: How do you think that could have changed things for you, when you came onto the tour back in 2006 to have had so many ranking events back then? MJ: I like to think that I would have been a little higher in the rankings by now, but it’s hard to be too critical and look too much into the rankings when there were only 6-8 tournaments each season. I think after this year you will have 40-odd events which will give a true reflection of the ranking list. 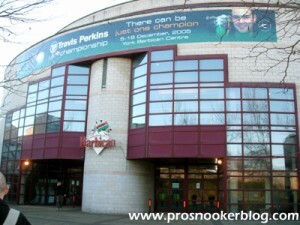 In the past if you lost your opening match in the UK Championship, World Championship or both then it was a disaster. 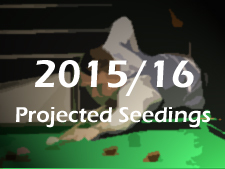 You could have five good tournaments, lose in the first round of the worlds and it became a bad season. Now however there shouldn’t be so much emphasis on the one tournament, especially with the PTCs so everyone has got a chance haven’t they? PSB: Looking at the PTCs, how have you found those? Do they add extra pressure from a financial point of view with the expense involved, particularly to mainland Europe? MJ: I am very lucky really as I’ve had a good sponsor, since I was 19 to be honest so I’m probably not the best person to ask in that department because financial pressure doesn’t affect me as much as some of the others in the players room. All my expenses are paid for me although I have to pay a percentage of my winnings back, but at least I know that I can afford to enter tournaments. As it happened last season I had quite a good season financially, obviously with the UK where I got £21,500 with the highest break and everything so that took a lot of pressure off me. But yeah things are tough, particularly with the European ones where you have got to win three matches to break even and it’s not easy. That’s probably the only downside of Barry Hearn’s vision because unless you have backers or wealthy parents then it is tough for a lot of the amateurs to get out into Europe and play because you are throwing £500 away really. From my point of view you have got to win three matches by the time you have converted the prize money back into sterling and paid taxes and everything. In effect you are paying £500 to buy a few ranking points really for the European PTCs. That said the PTCs in England do offset that a little bit, it’s not very far for me to go so my expenses are next to nothing really for the English ones, but you do suffer a little bit when you go abroad. PSB: How did you find it from a travel point of view last season? MJ: I think there were a couple of PTCs that were one week after another which was quite hard, going away on the Thursday, coming back on the Sunday, then heading back to the airport on the Thursday but you have got to just get on with it. I think this year there are more tournaments abroad than there are in the UK and it is just something we are just going to have to get used to unfortunately. Barry Hearn has got this vision for the game to become more global so we have got to be prepared to do a hell of a lot more travelling. MJ: Oh yeah you can’t believe how close the vote was really when you look back, that he only got in by two votes. If the vote were to be done tomorrow then you can’t see too many people voting against him! He has had a fantastic first year in charge and the game can go from strength to strength really, there is no reason why not. His challenge is to create a circuit where players can play 52 weeks of the year, that’s what he said in his letter to the players so we’ve got to be prepared to play a lot more snooker, but you can’t fault it, that’s our job at the end of the day, if you are a professional snooker player then you want to play snooker. The travel is not all bad either, how many jobs are there where you get to go all around the world? PSB: Is Australia one that would excite you? MJ: Definitely. Obviously I would not fancy the journey, I don’t think that anybody would, it will probably take a day and a half to get there but what a great experience, to play snooker in Australia. It would be great but we will cross that bridge when it comes, there are a couple of qualifiers before Australia first. MJ: Yeah a big United fan, I try to get up to Old Trafford as much as I can though it’s getting harder and harder with all of the tournaments on the calendar at the moment but every time I am free I try to get up there. I also play a little bit of golf. Obviously I have had to suspend my membership this year with what has happened to my arm, I have found that it is getting a little bit more sore playing golf than playing snooker. MJ: Yeah there are a lot of technical things that are the same in terms of having to keep your head still and different things but I’ve played golf since I was young anyway. I’ve got a nice course within a stone’s throw so I joined there. 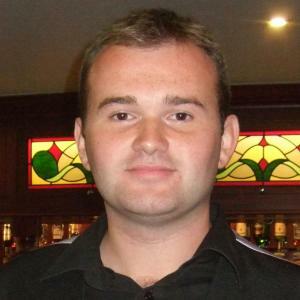 The main reason why I joined there really was because back in 2008 when I joined we had that much time between tournaments and such a long break in the summer that I just needed something to get away from the snooker club and switch off from the snooker. Now the more tournaments I am playing in I’m not getting enough county golf in so it is costing me more and more every year. I used to get my money’s worth but last year I got about a dozen games of golf in! But I can’t complain, I would prefer to be travelling and playing more tournaments than playing golf but it’s nice to have there if I fancy a day off from the snooker. It’s a great way to just switch off and enjoy yourself. PSB: Finally, are there any events that you would particularly like to qualify for next season such as the Shootout or obviously the Crucible? MJ: I think the Shoot Out I should hopefully be safe for after the first cut-off! I was disappointed to miss that this year though as it happens I wouldn’t have been able to qualify for it anyway because I had dropped out of the 64 but I wouldn’t have been able to play in it anyway with my injury. Obviously I’ve watched it on the telly, Nigel won it, happy for him because I play with him and he is my closest friend on the tour and it looked great fun so that will be something that I will look forward to playing in. That’s just a bit of fun but on a more serious note really I just want to have the right attitude whether it’s the PTC or qualifying for Australia or qualifying for the World Championship. My attitude this season is just to go into each match and think I can win the tournament, whether I win it or lose, that looks after itself doesn’t it? Just want to go into each frame, each shot and give my best every match. Snooker is not just a game where you can click a button and go through the gears, you can’t go into the World Championship and think I am going to play better snooker, it doesn’t work like that. 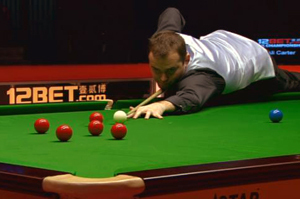 It’s nice but the right attitude is like John Higgins, every tournament he enters, he tries to win. PSB: Yeah he impressed me last week because he was playing amateurs and was leading comfortably but would still play on needing snookers which I found incredible. MJ: Yeah I think that is the attitude that you have got to have, whether you are playing in the Pink Ribbon or a PTC or a local pro-am tournament. Any tournament you have just got to go in with the attitude that I am going to win it. Thank you to Mark for taking the time out to chat and best of luck to him for the rest of the season.